You can get secondhand loans too! For a range of reasons, investors use the Bondora Secondary Market to exchange their loans amongst themselves, which they previously acquired through the Portfolio Manager, Portfolio Pro, manual investing or the API. If you want to sell loans from your portfolio or buy them from others, the Secondary Market is the place to go. If you’re thinking of investing manually via the Secondary Market instead of using our other options, please be aware that this is a high-risk strategy that often results in a lower net return (and even losses). Below, we’ll walk you through the options and functions available to you and what you should pay attention to. The Secondary Market has a wealth of interesting features for multiple purposes. You may want to sell overdue loans in your portfolio, or you may be pursuing a strategy that requires very specific filters. To give you an example - there are a small number of investors at Bondora who have a strategy of buying defaulted loans at a very low price, with the plan to reap the rewards later on when the loans are generating a cash flow from recoveries. This strategy requires a lot of patience and nerves, so it is not suitable for everyone. It’s an extremely high-risk strategy - we would not recommend it unless you know for sure what you are doing. Of course, the activities in the Secondary Market can be fun. However, we cannot confirm that a high level of commitment and research will result in returns higher than our automated services. On average, the returns of investors who are very active in the Secondary Market are not competitive with those of the passive investors who bought their loans via Portfolio Manager or Portfolio Pro. Not to mention those investing via Go & Grow. What’s more, it’s considerably time-consuming to invest manually because it’s likely you will be checking out many loans individually. Before starting, think about this and consider whether it’s worth your time. You may also plan to liquidate your Bondora portfolio completely and therefore want to sell all of your loans. You can use the Secondary Market to do this. However, if you have a lot of loans, this task can take longer. The quickest way is to use one of our other services which will make the job easier. This includes Portfolio Manager and Go & Grow. Portfolio Manager can automatically sell your loans on the Secondary Market, without you having to do all the leg-work. Please read the "Sell loans" section in the Portfolio Manager Guide for more information on this. With Go & Grow, you do not sell your loans to other investors, but to Bondora, and you can immediately withdraw the amount once you accept our offer. Please note that selling loans before maturity often results in a loss of interest or capital. 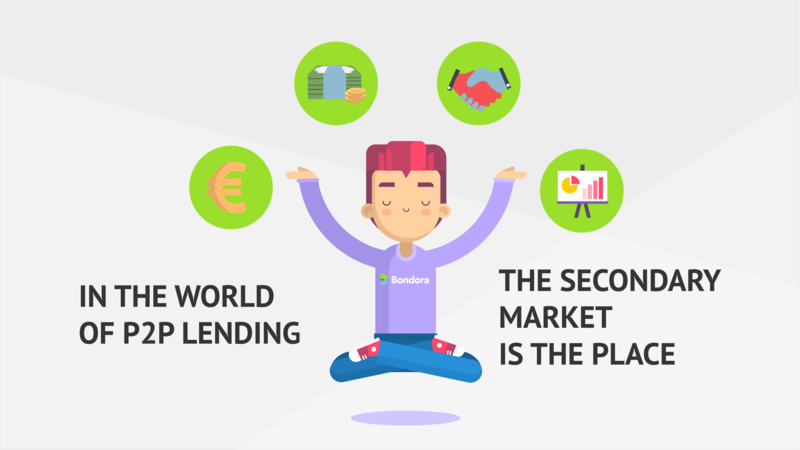 The Secondary Market is significantly different from our other automated or semi-automated services for buying Peer-to-Peer loans; it’s certainly the most time-consuming of all. With the exception of a few presets that you can set when selling your investments, nothing happens automatically here. You have to buy each loan manually. Therefore, engaging in the Secondary Market requires much more activity from you. Along with the API users, you also need the most know-how to be successful. As mentioned above, an increased amount of time is not equivalent to a higher return. On the Bondora Secondary Market, you can buy both individual loans and whole portfolios. If you want to buy portfolios, check "Show portfolios" in the upper right corner. Next, browse the loans for offers that suit you. Later in this guide, we’ll give you some tips in case you are still unsure what to look for when choosing. On the far right of each line, you will find the symbol of a shopping cart. If you click on it, you have not yet bought the loan or portfolio. You will need to confirm your purchase and the new contracts to complete the purchase. All items in the shopping cart are reserved but not binding for you. To sell your loans, switch to the investments tab in the main menu. On the right side of each line, you will find the settings options for selling your loans. Just enter a percentage in the “Discount / Markup” column for the loans you want to sell at a premium or discount. Enter a negative numeric value if you want to sell the loan cheaper at a discount, and enter a positive numeric value if you want to sell it with a premium. The expected income is calculated automatically. The XIRR will be calculated and displayed later when your offer is released into the Secondary Market. To do this, first, place your selections in the shopping cart and confirm your sales once more by clicking on "Sell all" above. In the following window, you will see your sales list, which is a summary of all the loans you want to sell. After that, you can specify a Bondora user to whom you would like to sell the loans to directly. Also, you can specify that you want to cancel the sale as soon as a repayment on the given loan is received and also when the payment plan is rescheduled. In essence, this gives you some confidence that if the borrower (who is currently overdue) begins to make their payments again, you won’t miss out by selling your investment in the loan. In the same window, you can specify that all selected loans should be collected and sold as a portfolio. Simply put a checkmark next to "Sell as Portfolio", then you have the option to set a portfolio price if you choose. Buyers will then have to purchase all of your loans in one package for the set price. Important criteria such as the Bondora Rating, interest rate, loan status, the future scheduled payments and the cost are visible in the overview section. This is so you can get a quick and rough idea of the loans on offer. For a more in-depth look at individual loans, as with your own investments, you can either click on the loan to see more information about the borrowers; their income and expenses, payment issues, and the loan schedule - or you can expand your overview with further features via the settings wheel in the top right corner of the page. You can access more information by hovering your mouse over specific criteria. The cost is the seller's quote request you have to pay when you decide to purchase a loan. It consists of the outstanding principal the borrower has to pay, inclusive of the premium or discount applied. Premiums and discounts are determined solely by the seller. In general, premiums are added when the loan is being repaid on time by a reliable borrower and is expected to continue to generate a good return for the owner of the investment share. On the other hand, loans may be offered at a discount if there have been irregular payments made by the borrower. By checking out the percentage in the brackets behind the cost, you can see whether a loan is offered with premium or discount. If it’s a positive number, then a premium has been applied, and when you see a negative number, it’s offered with a discount. If 0% is estimated, the loan will be sold at par. To buy the loan, you then pay exactly the amount of principal the borrower has to pay back in the individual note. Before buying any loans, you should check whether the future payments are higher than the price request. Otherwise, you will pay more than you can get back (including interest). Although it makes no sense for the buyer, such offers are occasionally being made. Therefore, the gap between the cost and future payments is already a very important indicator of whether the offer can be a good deal for you. Afterward, you should get a more detailed picture of the loan, for example, by looking more closely at the overdue principal and the accrued interest and late charges. The XIRR calculation is the extended internal rate of return that lets you see how much return you can earn during the remaining duration of a loan. If the number is green and positive, this indicates a possible profit in the longer term; if negative, it indicates a possible a loss. However, before you consider the XIRR as the sole factor in your decision-making, you should take a look at the borrower's payment behavior. Maybe you will see a new loan which (naturally) has a high return expected, but is recently overdue. In that case, it’s up to you to evaluate how likely a repayment is. The XIRR considers the loan issue date and amount, the repayment dates and amounts and the principal balance according to the original repayment date. In this calculation, overdue principal payments are written off immediately. For overdue loans, there is a chance to earn more return than is estimated in this number. No provisions for future losses are made and only received (not accrued or scheduled) interest payments are taken into account. The credit score is a numerical arrangement of the payment behavior of the borrower. It’s classified on a scale from 500 to 1000 and provides an overview of the payment behavior over the last three years. The longer any payment issues have passed, the higher the number, with 1000 indicating that no payment issues have been reported so far. Hover your mouse over the heading of the credit score to check out what each of the numbers means. The status indicates the current payment status of the loan. Current loans are green, overdue loans are orange (1-74 days) and defaulted loans are red (75+ days). If the criteria you see in the overview is not sufficient, you can expand it by using the settings wheel in the top right corner of the page. By default, you'll see features such as the Bondora Rating, status, principal overdue, and cost. The settings wheel allows you to add many interesting features and criteria, such as the recovery stage, rescheduling dates, age and gender of the borrower, debt servicing costs, and much more. It may look inconspicuous at first glance, but it is a powerful tool that can assist you effectively in finding the loans you are looking for. You can filter the overall supply of the Secondary Market according to numerous criteria. If you can’t find the filter you’re looking for in the overview, select more in the lower left corner. If needed, you can save your filter, so you don’t have to remember and re-enter everything on your next search. The search function offers another very handy feature that can be overlooked sometimes. If you sell your loans on the Secondary Market and only want them to be displayed, select "Yes" in the "Show my items" option. If you’re looking for attractive offers and you want to avoid the loans you have on sale being displayed, select "No" and you will only see offers from other investors. We hope we've been able to help you with this guide and answer most of your Secondary Market questions. If you are still unsure, the Investor Relations team will provide you with first-class support in English, German, Estonian and Russian. Write an e-mail to [email protected] or call +44 1568 63 0006.